That is certainly great advice at times and for certain aspects of one’s business, but when it comes to being a content writer and business coach, eating from the proverbial smorgasbord gave me understanding and experiences that were the seed of my writing career. My life motto is ANCORA IMPARO. It means, “I am still learning” and was spoken by Michelangelo when he was quite elderly. How impressive to have a man of such caliber and one who accomplished so much still keep a humble, teachable spirit. Learning is more than acquiring knowledge. Learning is about soaking the marrow out of life and then involving as many people as possible in your discoveries and enthusiasm. Today I was asked to identify why I write. In the past, that would have been a difficult question to ask. About three years ago I started to seriously ask myself that question, and it took me nearly a year to dig deep enough to realize that my motivations and my “why” did not match up with what I was really doing. It took another year to get the courage to stop what I was doing as a retail shop owner, to make room for something that matched up with my “why” at a little better. That’s when I started writing. I didn’t set out to be a writer. Actually, I was blogging in order to sort out my thoughts and find my next steps. I loved writing, but the only writing I did was a personal journal and a directionless blog. I NEVER thought of myself as a writer; honestly, writing professionally was not on my radar. However, it was through doing what I loved that new opportunities opened up. In a single year, I went from poking around a personal blog to having several clients I work for and even having my first published article in a magazine. I feel alive and energized when I write. Writing offers variety and creativity. Fuels my intense desire to always be learning and growing. Allows the flexibility of time to be available to my family. Provides a venue to satisfy my nonstop impulse to share everything I learn, because if what I discover helps me, it will help someone else. I can write from anywhere. It’s an avenue to funnel all the lessons I’ve learned over the years from business, parenting, knowing God, relationships, and self-discovery. Ultimately, I feel like nothing in my life was a waste because writing offers a way for me to turn experiences and lessons in life into resources and stories than can improve experiences in life for others. For the love of learning. ANCORA IMPARO! What is your why? I’d love to hear from you! p.s. 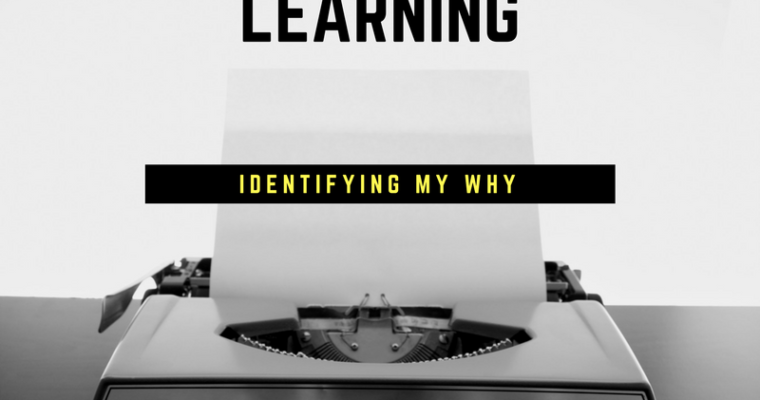 For really good insight into yourself, after your write out your “whys”, dig a little deeper and ask yourself “why is that your why”….that is where the good stuff is!